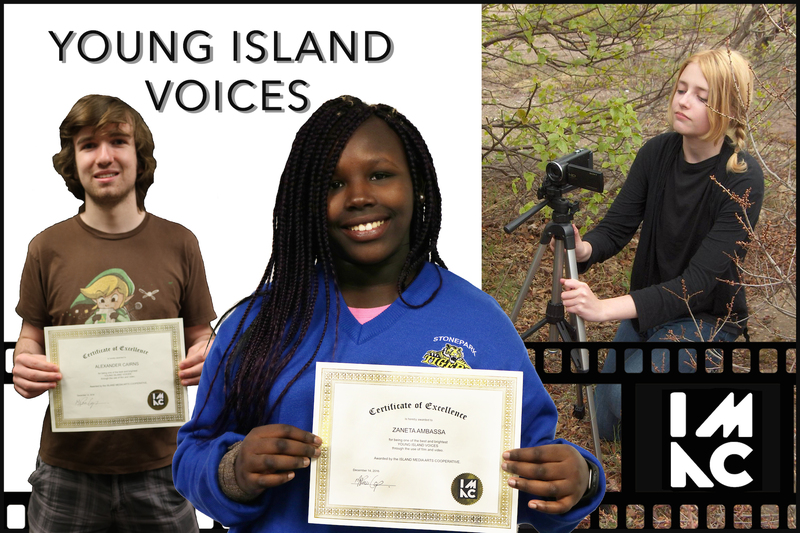 In 2016 the Island Media Arts Cooperative ran the Young Island Voices project. Our Youth Program Co-ordinator Noah Hoskins travelled across the Island to introduce teens to IMAC as a resource hub for young Island filmmakers. IMAC challenged youth to tell their own stories with film and three industrious teens took us up on our offer with fantastic results. Keelin Fremlin, Alexander Cairns, and Zaneta Ambassa created unique pieces with strong themes and engaging plot lines. Seventeen year old Keelin Fremlin submitted two short films. The first, A Cup of Tea, follows a little girl (played by Evie Grace Mawson) living with an alcoholic mother. She dreams of a land and characters much like the ones written by Lewis Carroll in Alice in Wonderland to distract herself from her harsh reality. Keelin’s second piece Melody is an avant-garde, two and a half minute montage of her friends and peers speaking, playing music and making art while an angelic voice recites a monologue about the importance of music and creation. So inspiring! We look forward to following Keelin’s exciting career as a filmmaker. Alexander Cairns (17) and his collaborators explore themes of teen drug and alcohol abuse in his short-film YOLO. The film follows a young man on a steady path to success. Unfortunately he falls off the tracks and ends up fraternizing with the wrong crowd with very poor results. The realness of this short acts as a warning to youth. Alex says the biggest thing he learned from this project was how to properly collaborate with his partners, “Even when your plans start to fall apart, you can make compromises and still finish with a great product.” We hope to see more work from Alexander in the future! Twelve year old Zaneta Ambassa’s short film Muted follows a young musician who has been unintentionally muted by The Big Guy in the Sky as he relaxes in his “control room.” Seeing this character interact and attempt to communicate with her peers as she come to terms with her inability to speak is charming and comical. Zaneta wrote the script with her sister in a mere three days, “We didn’t want to forget anything and we didn’t want to take any breaks just in case!” Zaneta is a star in IMAC’s books and we look forward to seeing her next short! To encourage these enterprising young filmmakers, IMAC’s Executive Director Renee Laprise proudly awarded each a $250.00 grant in support of their next project. “IMAC is thrilled to support young, local artists and their dreams. We are here to help you tell your stories.” Youth interested in filmmaking are encouraged to contact IMAC. We want to see more films by youth in 2017. Tell us your story! IMAC would like to acknowledge the support of the PEI Community Cultural Partnerships Program and the Canada Council for the Arts. This entry was posted on Thursday, February 2nd, 2017 at 2:07 pm	and is filed under News. You can follow any comments to this entry through the RSS 2.0 feed. Both comments and pings are currently closed.